Mold begins with a spore, which grows into a strand called hypha. Over time the hyphae become dense intertwined mat (mycelium). This is the stage we visually associate with the presence of mold. At this point, sporulation takes place, producing the next generation of spores. And so the cycle will continue, unless interrupted. 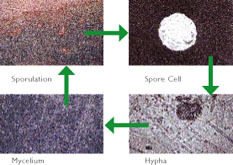 The enzymes in XSpor's formulation are tailored to interact with mold proteins and render them harmless. The process is all natural and non-volatile, meaning that the effectiveness of the XSpor treatment persists, penetrating the mold build-up thoroughly, reaching affected areas well below the surface and point of first contact. Mold is a living organism. It doesn't really spread --- it grows. Stop the growth and you've stopped the mold problem.